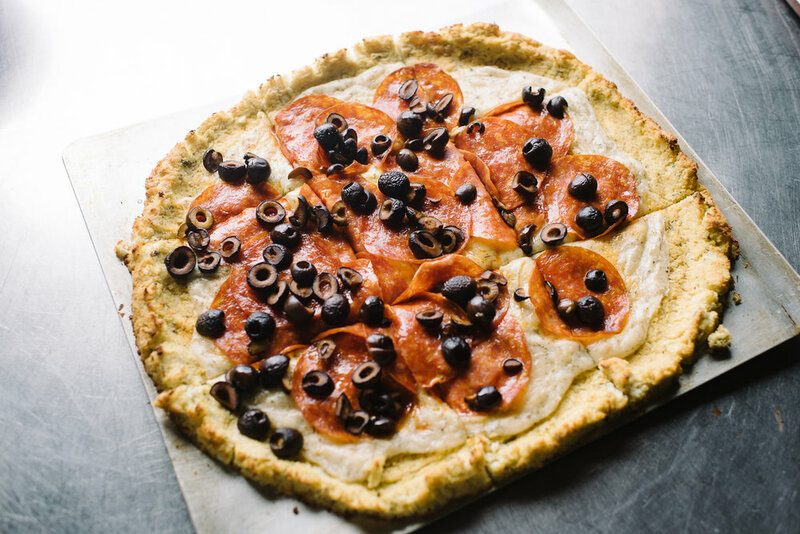 We're slow to the cauliflower crust train, mostly because every recipe I stumbled upon used cheese. I assumed that's what really held it together so I was always turned off by the idea of trying. I decided to give it a go tonight because we had two cauliflowers from our produce box- our produce box is a constant source of inspiration. I added an extra egg and lots of spices, plus a little coconut flour. You really have to squeeze out the liquid from the steamed cauliflower, probably at least a couple cups worth of water, so I though the coconut flour may help a bit since it's known for absorbing lots of liquid. Overall, I think it worked well. Next time I'd try cooking a bit longer, it wasn't crispy enough to pick up like traditional pizza, but was just fine to eat with a fork. The white sauce also really tasted cheesy- it's amazing how well arrowroot works for mimicking melted cheese. 2. Rice the cauliflower in the food processor, blender, by hand, etc. Either place in a microwave-safe bowl and microwave for 8 minutes or steam on the stove top. 3. When cauliflower is done, you need to squeeze every last drop of water out of it. This is not an easy process- the cauliflower will be HOT after cooking, so let it sit for a bit or just be sure you don't burn your hands. Just make sure you really squeeze it out, it'll be the difference maker in the pick-up ability of the crust. 4. Place all the ingredients in a large mixing bowl and using your hands, knead together into a ball. 5. Either grease a large pizza pan, use parchment paper, a pizza stone or a silicone pizza mat, and place the ball in the center. Using your hands mash and spread into the shape of a pizza crust. This dough recipe makes one large pizza, with enough to make a legitimate crust around the edge. 7. Remove from oven, put toppings of choice on the crust, then bake for an additional 12-15 minutes. 8. Let pizza rest for 5 minutes before cutting. 9. White Sauce: pour olive oil in a medium saucepan, whisk in arrowroot starch. Once smooth, pour in milk, whisk together, then add seasonings. Whisk for another minute or so, until it becomes stretchy then pour onto crust and spread out evenly. Place toppings on top of sauce.